Here, our Community Manager Candida rounds up our Secret Slimmers and Momentum Maintainers highlights of the week, with everything from amazing weight losses, non-scale victories, words of wisdom and tasty recipes. 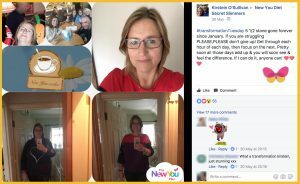 Welcome to this week’s community update and what a spectacular week it has been on Secret Slimmers. The gorgeous sunny weather has spurred you on to get in gear for losing those pesky pounds. Nobody wants to be shrouded in layers in blistering hot sunshine with holidays and excursions booked for the following months. This week has seen the launch of the June Weight Loss Challenge. You were asked to register on the blog and what a fabulous response we had. With over £600 worth of incredible prizes to give away and losing weight in the process, why would you not register? So far, (and you can still register), you have a whopping 123 stone to lose between you. That is 1720 Ibs!!! Update your weight loss every week and let’s see those stones and pounds disappear on the leader board. So, what have you lovely lot been up to this week? Well, from selfies with the stars, super weight losses and training for runs, I would say, pretty busy! Massive congratulations to Kirstein O’Sullivan for having lost five and a half stone so far. She is the forever shrinking woman and is looking amazing! Her commitment to the plan is unsurmountable and we are all so very very proud of you! I feel a super success story coming my way! Shirley Brown has had a brilliant first week. 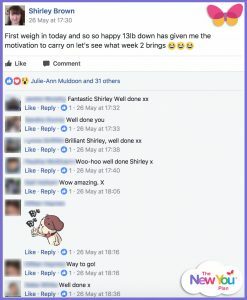 She posted: “First weigh in today and so so happy 13lb down has given me the motivation to carry on let’s see what week 2 brings.” – You are going to smash this Shirley! I loved Julie Garnham’s post this week. She said: “End of week 7 and another 2lbs gone. Now 12st 2lbs. Haven’t gone below this in about 11years.” – She is feeling fabulous and even had to go shopping for new clothes, which is something she used to dread. There is no better feeling than buying a smaller size, trying it on and it fits! This gives you a confidence boost and the motivation to carry on with your journey. Happy days! 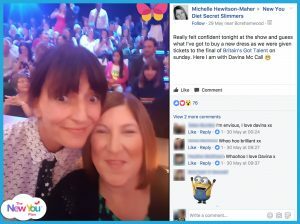 The lovely Michelle Hewitson-Maher has been rubbing shoulders with the inspirational Davina McCall at the semi-final for Britain’s Got Talent AND has been given free tickets for the final this week! Jealous? Moi? 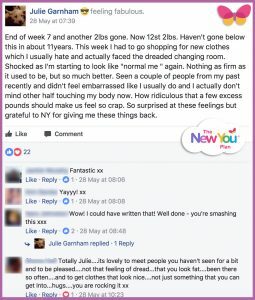 She is off to buy a glamorous dress to go with her new-found confidence since losing weight. I hope she will still remember us now she has famous friends! Have an incredible time Michelle and keep those selfies with the stars coming! Some lovely dishes are being created in both Secret Slimmers and Momentum Maintainers. Your culinary delights have been making my mouth water! 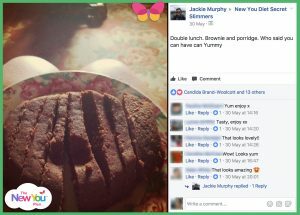 Jacki Murphy had a double whammy the other day; Brownie and Porridge Loaf and it looked soooo good. Make up a little Chocolate Shake and you have a super choccy sauce to go over it! Yummy! When you move over to Momentum Maintainers for refeed or maintaining, we really encourage you to post pics of your dishes. This helps us to guide you and keep you on the right track. Planning is key for Momentum Maintainers as this eliminates bad blips and keeps the cost down too! Keep those photos coming guys! 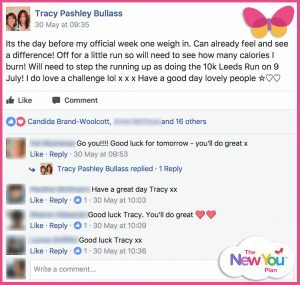 Finally, Tracy Pashley Bullass is going great guns with her weight loss journey as she trains for the Leeds 10k run. She is amazed to find out that even after her first week she can see and feel a difference. Good luck for your 10k run in July – you can do it! Woohoo! So there we have it slimmers, another tip top week of triumphs, non-scale victories and awesome losses. Join in the June Challenge and let’s get beachtastic. The only person stopping you is YOU! Success is the sum of small efforts, repeated day in day out. Have a wonderful week!